There isn’t a whole lot that you need to get paddling. In fact you can just grab your paddle, push on out into the water and stand up & give it a shot. There are some basics though that will help you out. One of my favorite subjects is technique and there are different schools of thought. We’ll definitely dig into those in the future but for now, we’ll talk about some concepts that are common among all. BOARD TIP: With regard to your board, the first thing to note is that hand well (if your board has one – and most do) is located right at the center of the board’s gravity. So when you get on your board, you want to kneel around it and when you stand up, you are going to want to stand up around it. When you go to get on your board, make sure you’re far enough into the water that your board and your fin are not going to drag on the ground. Then bend over and hold your board with both your hands just a bit higher than the center hand well. Hold it still and slide your first knee on just outside the hand well. Then holding with both hands, push off and pull your other knee up on the other side of the hand well. As you’re heading out, there are 3 main positions you can take. You can kneel on your heels. This is going to keep your center of gravity lowest and keep you most stable. If your ankles aren’t flexible though, it might be the most comfortable position. Some folks also feel some arch pain in this position. I personally (with some stretching of the ankles, knees and quads) find it quite confortable and will often drop down if I’m waiting for someone or if I’m doing a lot of talking. If you’re paddling on your knees, don’t try to grasp the handle at the top of your paddle. Keep your top hand also on the shaft and keep both thumbs up. You can then kneel upright. This is a bit more comfortable than kneeling on your heels and it’s a bit less stable. It’s a good interim step before standing up though. And then you can stand. This is by far the most comfortable but it’s also the least stable. 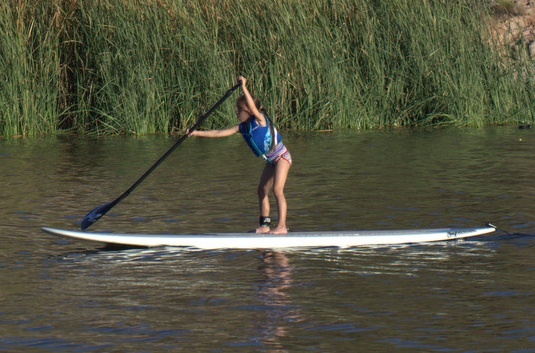 Standing with your board still is about the hardest thing you can do on your SUP. 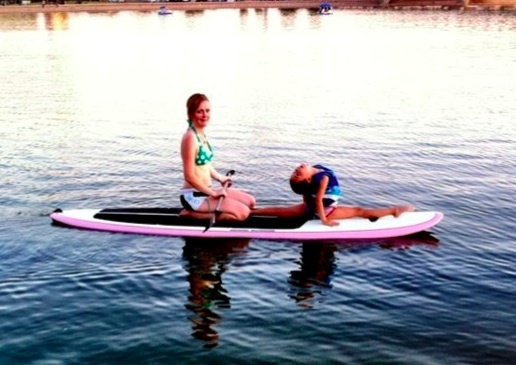 Once you start paddling, the paddle acts as another “leg” that you can use to balance yourself. To stand up, get your hands back down on the board so you’re on all fours. Then pull one foot up outside the hand well. Then pull the other foot up. Then push off your hands into a standing position. As far as your foot placement, you stand with your feet side parallel surrounding the hand well. The further out your feet are, the more stable. When you first start paddling, you might find balancing just a bit of effort. It only takes 2 or 3 times out to get really comfortable and turn the standing into more of a “bone movement” but your first couple, you could very well feel like your legs are working hard. Also a good idea to keep just a bit of flex in the knees. Another good tip is that you want to keep your feet and toes loose. Some people experience some arch pain when they get on a board. It typically comes from grabbing the board with your toes. Keep your toes loose and you’ll pretty much avoid this. 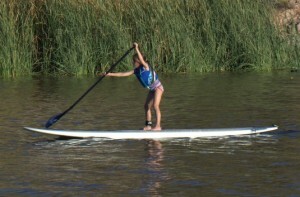 PADDLE TIP: When paddling, one thing you need to do is find the proper hand position for you on the paddle. A good starting point is to hold the paddle up over your head and make sure you have about a 90 degree angle between your upper arm and forearms. That is a good rule of thumb and then you can experiment with your hands wider and narrower to see what works best for you. When you paddle, you want to make sure that the angle in the blade (if there is one in yours) is pointing forward. Additionally, most paddles have a decal on them. That typically should be pointing forward (really just an indicator of how the angle in the blade should go). Another fundamental is that you paddle on both sides. You paddle on one side and then to correct the course of your board or to give that side a breather, you switch to the other. Switching is done by letting go with the top hand and bringing that underneath the bottom hand and then sliding what was the bottom hand up until it grasps the handle and becomes the top hand. A big, huge key to paddling well is to try to take your arms out of it. You don’t want to be bending your elbows and trying to move the board with your arms. Your biceps and triceps will get fatigued quickly & you’ll be done. The idea is to keep your arms pretty straight with just a bit of bend in the elbows. So what you do use is lats, obliques, abs, lower back to rotate your shoulders around your spine. The shoulder of the bottom hand reaches way forward while the shoulder of the top hand rotates back. You also want to bury the whole blade of your paddle in the water before you start pulling. Ideally the water around your paddle will stay quiet. You won’t see any ripples or waves. Ripples or waves (often called cavitation in this scenario) just takes power away from your stroke. And during the stroke, you don’t want to pull too far back. When you get past the point where the paddle is perpendicular (this is where the 10 degree angle of the paddle helps), you’re actually pulling the board down into the water and creating drag. Once you hit about your feet, quit pulling and bring the paddle out of the water. For a little more power, you can also bend a bit at the hips on the downstroke and put a little more body weight on the blade. Think about is keeping your arms and hands relaxed in the recovery. Keep your hands pretty relaxed throughout the stroke in general. There is no need to have a death grip on the paddle. Keep your paddle as vertical as possible when you are paddling. You don’t want it angled from the water with your top hand way over the middle or alternate edge of the board. 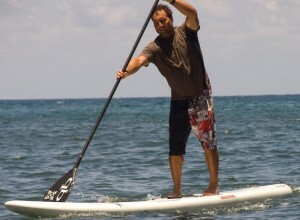 Keeping your paddle vertical will help keep the board going straight. Much, much more on this to come!! !